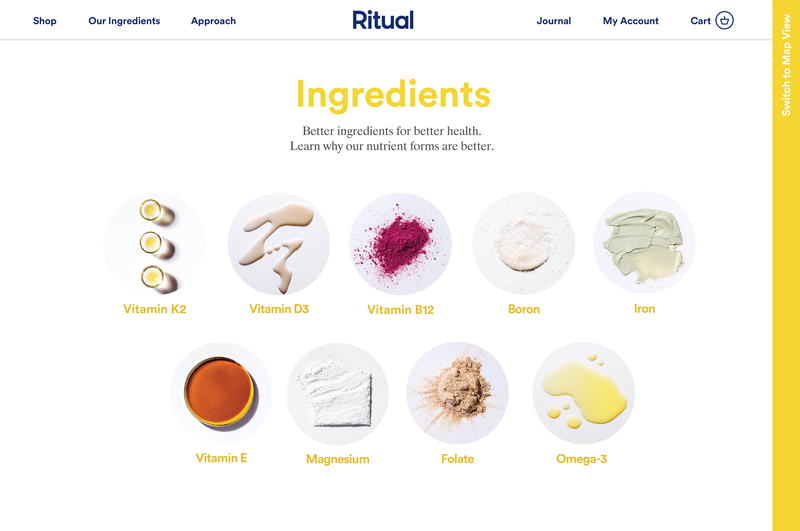 Ritual, a Disrupt Battlefield startup with a focus on women’s nutrition, officially launched today. We first told you about the company aiming to make a better vitamin for women last spring when Ritual’s founder Kat Schneider came onstage to present her business model. She made it to the final rounds for the idea, ultimately losing out to an interactive gaming network that was quickly snatched up by Microsoft. Now Ritual has taken its idea to the masses, going live today with its online subscription ordering process. You may be wondering why TechCrunch is interested in vitamins. How is this tech? And sure there are lots of vitamins available to you in the store and online. I normally order mine through Amazon. The tech part exists in both what Schneider refers to as “open-source” data of where the ingredients come from and a patent-pending beaded oil capsule for sustained release of the nutrients within — a necessary part of delivering nutrients to your body at the right time in a way that won’t cancel each other out. Zinc and magnesium don’t play well together if taken together, for example. Ritual also only includes the supplements you actually need in a Standard American Diet (SAD) and leaves out the stuff we tend to find in abundance in our foods already. We get a lot of Vitamin C, for example, so that’s not in the pills. The process is fairly simple. You order your 30-day supply of subscription vitamins; when they come, you take two a day, every day until another box comes. The ingredients are also pretty simple, and ones that women often need. It’s just Vitamin D (something a lot of people in cloudy or foggy climates like the Bay Area tend to have a lack of, Vitamin E, Vitamin K2 MK7, Folate, Vitamin B12, Iron 8, Magnesium, Boron and your Omega 3 fatty acids DHA and EPA. Along with launching the site today, the startup also announced it has closed a $3.5 million seed round of funding led by Forerunner, with participation from Norwest and NEA, and a reinvestment from Upfront Ventures and Rivet Ventures, bringing up the total now raised to $5 million.